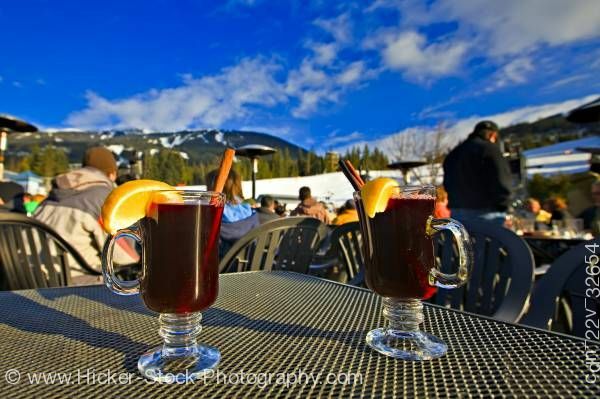 This stock photo includes glasses of hot gluehwein (mulled wine) served at the Longhorn Saloon and Grill an apres-ski bar at the base of Whistler Mountain, Whistler Village, British Columbia, Canada. Mulled wine, variations of which are popular around the world, is wine, usually red, combined with spices and typically served warm. Historically, wine often went bad. By adding spices and honey, it could be made drinkable again. Nowadays, it is a traditional drink during winter, especially around Christmas.